You can Tribute Summon this card in face-up Attack Position by Tributing 1 Zombie-Type monster. When this card destroys a Zombie-Type monster by battle and sends it to the Graveyard: You can Special Summon that monster to your side of the field. This monster is the cover card for Zombie World Structure Deck. This monster is the Zombie counterpart of Red-Eyes Darkness Dragon. This monster has an evolved, Synchro form: Red-Eyes Zombie Necro Dragon. The text "You can Tribute Summon this card in Attack Position by Tributing 1 Zombie-Type monster." of "Red-Eyes Zombie Dragon" is not treated as an effect. The effect of "Red-Eyes Zombie Dragon" to Special Summon the Zombie-Type monster destroyed by battle does not target. 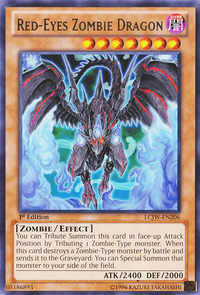 The effect of "Red-Eyes Zombie Dragon" activates optionally when the destroyed Zombie-Type monster is sent to the Graveyard. : When a monster whose Type is Zombie by the effect of "DNA Surgery" is destroyed by "Red-Eyes Zombie Dragon", can it be Special Summoned? If "DNA Surgery" is activate and declaring "Zombie", when a monster whose Type is originally non-Zombie battles with "Red-Eyes Zombie Dragon" and is destroyed, then the effect of "Red-Eyes Zombie Dragon" cannot be activated. If "Red-Eyes Zombie Dragon" battles with a Zombie-Type monster with equal ATK and both monsters are destroyed by battle, then you cannot activate its effect which Special Summons the opponent's monster. : If "Red-Eyes Zombie Dragon" and the other battling monster are both destroyed, then can you Special Summon the opponent's monster? If the Zombie-Type monster targeted by an effect like "Book of Life" or "Mezuki" or "Zombie Master" is not a Zombie-Type monster at resolution - for example, "Mystical Space Typhoon" was chained and destroyed "Zombie World" - then the effect which Special Summons the monster from the Graveyard is not applied. Also, for "Book of Life", its effect which removes from play one card in your opponent's Graveyard is still applied. : When resolving the effect of "Book of Moon", if the targeted monster is not a Zombie, then can it be Special Summoned?